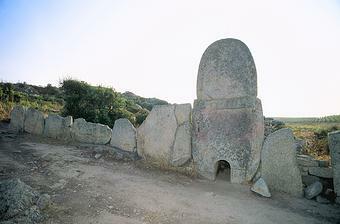 The Coddu Vecchiu Giant's Tomb must have been a massive structure when its original earth mound covered it. This dramatic site is similar to Li Lolghi, but its entrance has a carved stone slab, a horizontal lintel, and an arch above; a small opening at the base was blocked by a stone. Built from 2300 BC onwards, Sardinian Giant's Tombs have undergone many repairs over many years, and their final plan may be fairly complex. At Coddu Vecchiu the forecourt is about 12.4m (41 ft) wide and is composed of 11 upright slabs; the chamber is almost 10m (33 ft) long. Unfortunately, Coddu Vecchiu has suffered ill-conducted excavations over a long period.